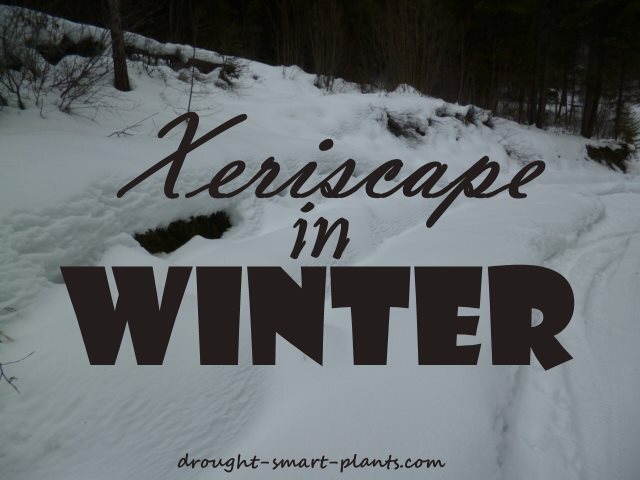 Winter's arrival doesn't mean that there is nothing of value in the xeriscape garden. The beauty can be even greater than the lush growth of plants, green and healthy through the summer. 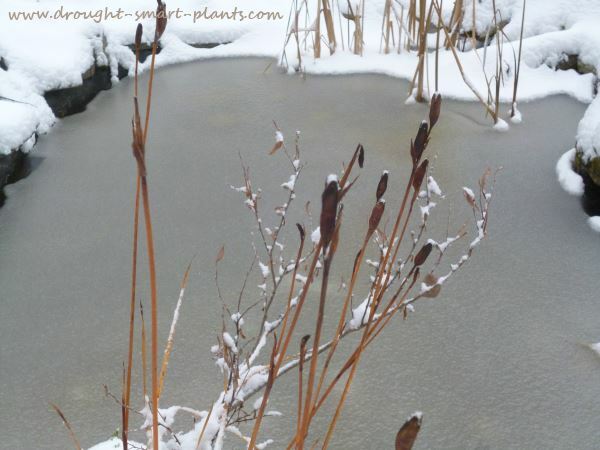 Seed pods, grasses and perennials with flower heads still on catch the early snow. The outlines and textures of leaves and stems, all limned with frost are spectacular and ever changing. I always recommend not cutting the stems of perennials back; this has many advantages. 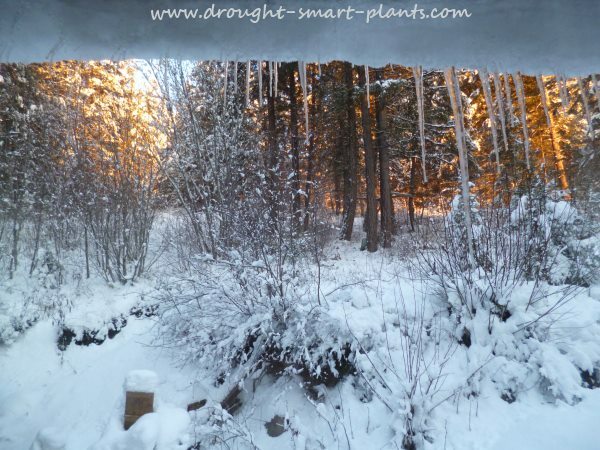 They are home to overwintering insects, and also capture the snow releasing it slowly as it melts in the spring. They are also very beautiful, and add so much winter interest. Here in Canada, there is a real need for that, as winter where I am is many months long. Birds feast on seed heads of grasses and other plants, sometimes huge flocks of Hoary Redpolls, other times a solitary winter wren finding spiders and overwintering insects. An ecosystem pond may look like it's dead, but under the surface many creatures - tiny salamanders and the nymph stage of dragonflies - nestle down into the cozy mud of the bottom of the pond. Winter is simply a time of resting and replenishing the stores of energy for a vigorous renewal in the spring. Many gardeners make the mistake of trying to keep the plants warm; heavy mulching with straw or other soft materials is an open invitation to mice and other vermin to make their homes. Cutting back the top growth of perennials and grasses is often thought to be desirable, but ever since I became a lazy gardener, I discovered that the flocks of butterflies and other pollinators in my garden became hoards. I'm convinced that leaving the cover of the stems and leaves of ornamental grasses and the spent flower heads has given them somewhere safe to overwinter. As an added bonus, the stems capture the snow, to release it slowly in the spring melt. Enjoy the hiatus of winter and see it's benefits; it's not a death, it's just a long sleep, in some areas longer than others. 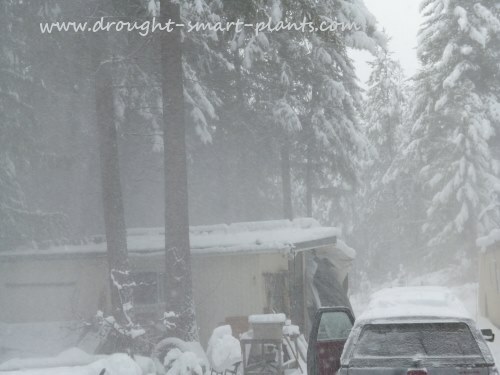 Twice as much fun; re-snowing, or when the wind blows hard enough to make a blizzard from the snow on the trees. The view from my window looking to the north and the last fading rays of sunlight - today, a deer was browsing not twenty feet from the house - cheeky!